The Healthy Boy: Are You Kidding Me KFC? Are You Kidding Me KFC? Just when you thought that Fast Food companies were becoming slightly more socially conscious by introducing healthier and nutritious menu items, along comes KFC and destroys all the progress with the introduction of the Double Down. This walking heart attack on a plate takes two saturated fat-loaded pieces of fried chicken, and uses them to replace bread to create a sandwich that will leave you with clogged arteries, greasy pimply skin, and blood pressure that will see you signing up for the next season of The Biggest Loser. 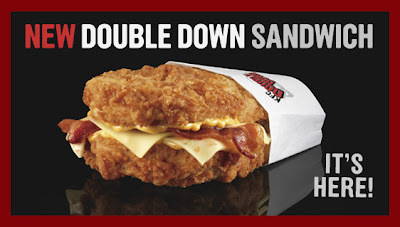 KFC's Double Down heart stopper contains two pieces of cholesterol popping bacon as well as two slices of stroke inducing Monterey Jack and Pepper Jack cheeses to gorge out at 540 Calories, 32 grams of fat - 10 of that being saturated - and a bloating 1380mg of sodium. There are worse options out there, like the Burger King Quad Stacker, but the design of this new food item is just nutritionally irresponsible as it appeals to people for all the wrong reasons. A big "No, No" from the Healthy Boy. Double Down? More like doubled over being sick. Just playing devil's advocate here, but how about the grilled option? Isn't that better? Hey Neekoh, Yes the grilled option is slightly better but still not good for you. It has 80 total calories less and 9 grams of fat less than the original recipe, but still has a whopping 23 grams of fat and 9 grams of saturated fat!! Well to be fair I think KFC is being honest with what this sandwich is. They are not trying to say its healthy, they are saying this is ridiculous and indulgent and that's why you should eat it.